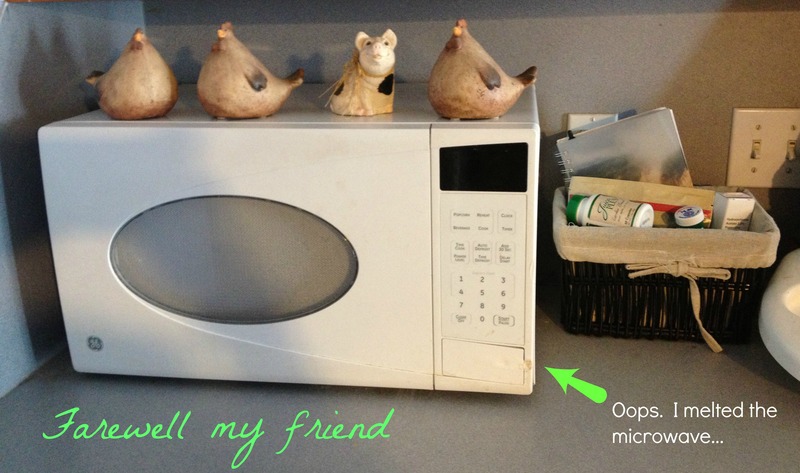 I can’t believe it, but yesterday, I said farewell to my microwave. I mean, like, for good. It’s been a good friend for the past 6 years despite the fact that I accidentally melted it with a hot pan. I used it mainly for warming up leftovers, rewarming coffee, and thawing meat that I forgot to take out of the freezer the night before. My microwave has been on hospice the past 3 months. It has slowly been dying. It started with just a random shut off while it was microwaving, flashing a PF on the screen (power failure), which could be fixed by unplugging it and plugging it back in. Somehow this would reset it. I could handle that as it wasn’t very frequent. But over the past few months, those random shut offs have been occurring more often. And I have to say it is really annoying when it should take 30 seconds to warm something up, but with the now less random shut offs/power failures, it ends up taking 2 minutes or longer. I couldn’t handle it anymore. So yesterday, I said farewell to my microwave. And I won’t be replacing it with another. *gasp* Are you going all crunchy mama on us?? Eh, not really. Maybe just a little bit. But I don’t want to really put a label on what or why I am doing it. I’m doing it because I feel its right for me and my family. Let me give ya a little background research that I did, and why I am choosing to not replace my dear old microwave. According to an article in the Harvard Health Publications, one of the biggest concerns about the use of a microwave is the possible carcinogens that may leak into the food from the various plastics used in containers. The FDA actually runs test to approve “microwave safe” containers. But there are some that aren’t tested. What about those? Do I have to research every single bowl that’s going into my microwave? Cuz this momma ain’t got time for that. What about microwave radiation? Am I going to sprout an extra head or arm because I use a microwave? The answer is no. When the microwave is manufactured, it is created in such a way that over its lifetime it will only emit up to 5 milliwats of radiation per square centimeter about 2 inches away from the oven surface. This amount is supposedly not harmful to people, but I’m sure there is research out there to counter that. Nothing is safe anymore! Many claim that microwaving your food kills off the nutrients as the water molecules in the food become “excited” and become energized, having an affect on the molecular structure of the surrounding molecules. Some nutrients do break down when heated, like Vitamin C. So what’s an alternative? What about boiling? Some veggies, like broccoli, actually loses some of the nutrient glucosinolate, which is a compound that gives broccoli its cancer fighting properties. However, boiling carrots, actually increases the caretinoid content. So could microwaving potentially increase the nutritional value of certain veggies nutrition because of less cook time? Sounds possible. Others argue that eating microwaved food can alter part of your blood chemistry. A study in 1989 showed that microwaved food actually decreased hemoglobin, good cholesterol and white blood cells. But my question about that is: what was being microwaved? Was it whole foods or processed foods? It’s already proven that processed foods contribute significantly to the obesity trend, and many processed foods are meant for the microwave. So naturally, if its processed foods that are being microwaved, sure enough you are going to get some alterations in your blood chemistry if that is all you eat. Have you seen the documentary Supersize Me? Gross! Why am I converting to a microwave-free zone? I have really limited (and mostly stopped buying) processed foods so the microwave is used mainly to rewarm leftovers, which is something a toaster oven can do. I often thaw my meat in the microwave. Without a microwave, I will be forced to pull my meat out ahead of time to thaw. This will make me be a better meal planner. Plus if I don’t feel like cooking, I can’t back out of the meal because I already have the meat thawed! What about things that call for hot water like oatmeal? My sweet friend Janee, who has been microwaveless for a couple years, gave me some great advice. Use your keurig. Perfect. I have (and love) my keurig! It’s going to force us to eat healthier when there aren’t any leftovers. It’s so easy to just pop something in the microwave on a busy day, especially at lunchtime. I get tired of sandwiches rather quickly so now I will actually be forced to cook lunch, and I can send the leftovers to work with Mr. Smartypants, so he will eat out less and eat healthier. Yesterday, I actually used my crockpot to cook lunch! I have a feeling my crockpot is going to become my new best friend. It will actually make me drink my coffee while its hot!!! I tend to get distracted and it may take me an entire morning to drink a cup of coffee. But I so don’t want to waste a k-cup, and I certainly don’t want to drink cold coffee! Now that I won’t be able to reheat my coffee, I will have to drink my coffee while its hot. The most “crunchy” reason I don’t want to use a microwave any more is the possible carcinogens found in the plastics in bowls that go into the microwave. I do not want to have to research every cup/bowl/container that I use. And hey, we had a microwave growing up and I’m alright. But who knows what research will show 5-10 years from now. So, all that to say, there are pros and cons to both sides. If you feel you couldn’t live without a microwave, I get it and I don’t judge you for it! I’m certainly not going to tell you what to do. You need to make the choice that you feel is best for your family. For my family, it is just one more step to what I perceive as a healthier lifestyle. How do you feel about the microwave? 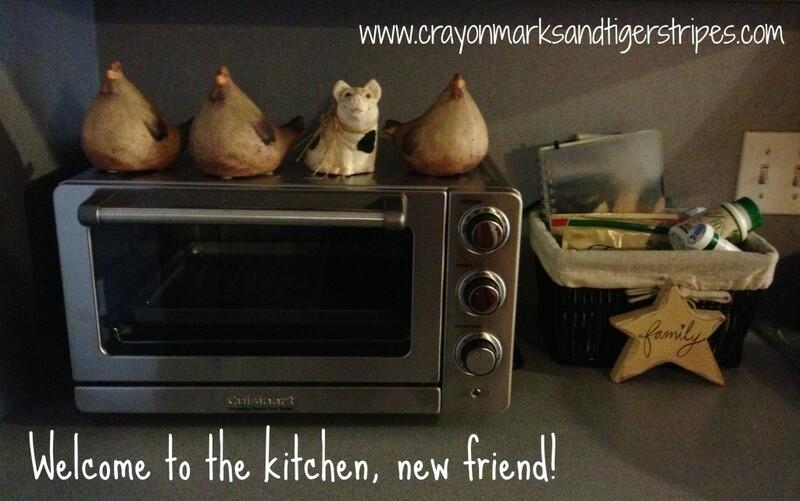 Do you have one or has your kitchen become a microwave-free zone? Share in the comments! Congrats on getting rid of your microwave. Mine’s built in, so I guess its here to stay. Like you, I rarely use my microwave. My kids use it for heating things up. Hubby uses it to defrost meat when it’s his turn to cook. I only use it to cook fish because it turns out best when microwaved. Those are all great reasons and I agree with you on pretty much everything in the post! I also fear the carcinogen s so I always put stuff on glass plates/bowls before microwaving! Alexa recently posted…No Holding Back is MOVING in here!!! It’s crazy! I don’t even miss my microwave!! I had no idea about the carcinogens. Glad I finally did some research!